How to bake perfect boiled eggs in oven – half an hour, muffin tray, and no water! Perfect for Easter! I strongly dislike boiling eggs! Anyone else feels the same? I love eating hard boiled eggs but making them is always a pain. Water keeps over boiling. Shells crack. I lose track of time and either under cook or over cook the eggs. Obviously, making eggs isn’t difficult and there are tons of instructions online and I tried them all. Bring to boil, cover and let them sit for 10 minutes (still they result in watery eggwhite). Slowly lower them into boiling water and let cook for 5 minutes (they crack and leak). Put in cold water, bring to boil and cook for 10 minutes (I keep opening the lid to see if the water is boiling and get impatient). It’s not difficult but those 10-15 minutes that they take isn’t long enough to do anything else but boring enough to actually start something else and forget about the eggs. So, what do I do when I want to make an egg salad or cook eggs for the week to have in the fridge as a snack or make a few of them for Easter? I bake eggs and they turn out amazing! Easy, no fuss, no water! 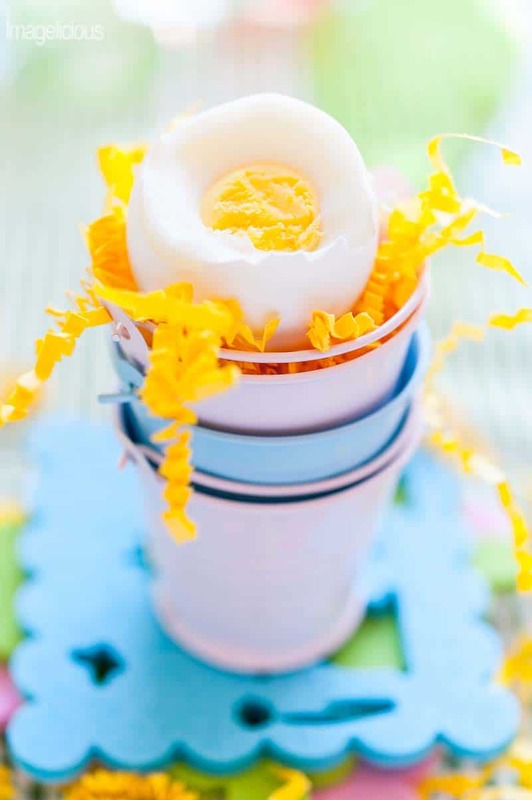 Let me tell you how to bake perfect boiled eggs in oven! I use a silicone mini-muffin tray as the eggs fit perfectly into each spot but regular muffin tray works fine. Technically you don’t even need a muffin tray and can use just a roasting pan but eggs may roll around on the way to the oven and crack by accident. I put the eggs into the oven preheated to 350F and just wait for 30 minutes. My oven notoriously takes longer so I usually do 40 minutes for firmer yolks but not more. And for a creamier but still hard-boiled yolk I bake only 30 minutes. 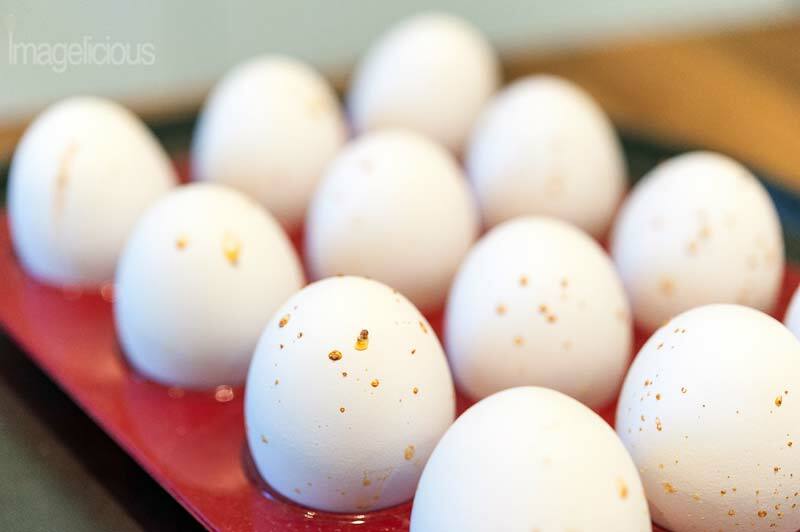 Usually after the eggs are done baking they are covered with little brown spots which wash off easily. I would suggest trying one egg first to determine how long it would take in your oven. It could be only 25 minutes maybe or longer. Once you know the time then you can bake a whole dozen. Place raw eggs in a muffin tin. One egg in each compartment. Bake in preheated oven for 30 minutes to get a creamier egg yolk and 40 minutes for a firmer egg yolk. Note: Test timing with one egg first before baking a few at a time. 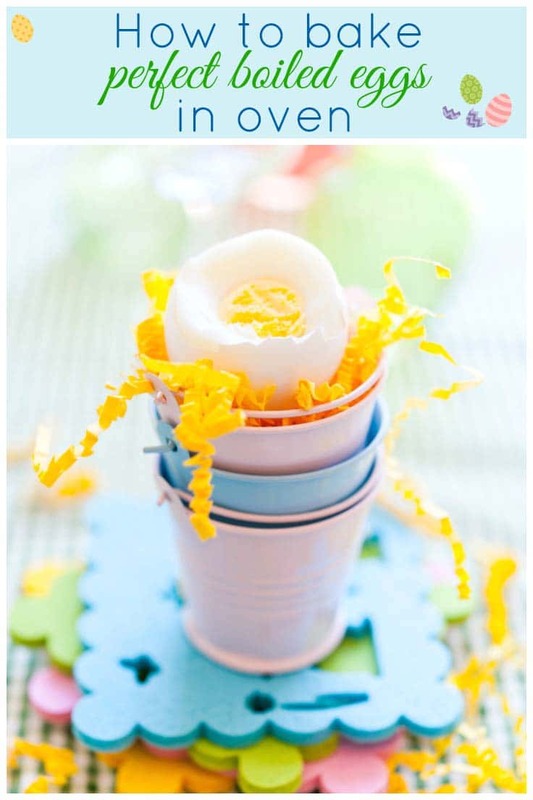 I use this totally awesome and amazing easy way to peel hard boiled eggs from Real Home Cook! If you like this trick on how to bake perfect boiled eggs in oven then make sure to check out Poached Eggs & Lentil Hash recipe from my friend Gloria of Homemade & Yummy, she has an awesome tip on how to make a batch of poached eggs for a crowd without any fuss. What temperature are the eggs when you put them in the oven? Right out of the frig., or room temp.? After baking, do you leave to air-cool at least a little while or do you immediately put them in a water &/or ice bath to stop the cooking process? What temp do you back them at???? I’ve always been curious to try baking eggs like this – yours look like they turned out beautifully! I love making eggs like this if I need to make a dozen or more! Give it a try!